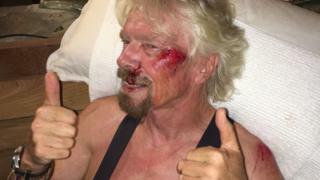 Sir Richard Branson says he thought he was “going to die” after crashing his bike on Caribbean island Virgin Gorda. 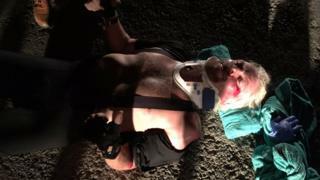 The businessman said he was “extremely fortunate” merely to have suffered a cracked cheek and torn ligaments. His bicycle “went flying off the cliff and disappeared”, he said. In a post on the Virgin website, the 66 -year-old said: “I was heading down a hill towards Leverick Bay when it suddenly got truly dark and I managed to reach a sleeping policeman hump in the road head on. “I really guessed I was going to die. I ran flying head-first towards the concrete road, but fortunately my shoulder and cheek took the brunt of the effects, and I was wearing a helmet that saved my life. Sir Richard said his assistant, Helen Clarke, was first on the scene as he was “lying prostrate on the road” and then another member of his squad, George, “sprinted from the bottom of the hill” to assist. 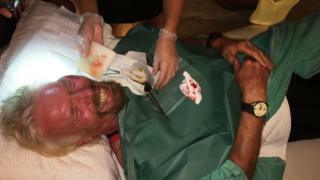 He travelled to Miami for X-rays and scans, and later posted photographs online indicating his bloodied face. The accident happened on the fifth anniversary of a fire which destroyed his luxury home on Necker Island. Sir Richard was cycling with his children Holly and Sam as part of his training for the Virgin Strive Challenge endurance event from the base of the Matterhorn in the Alps to the summit of Mount Etna in Sicily. He still hopes to take part in the event. “My attitude has always been, if you fall flat on your face, at the least you’re moving forward, ” he said. 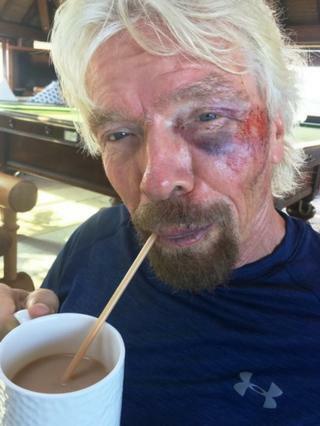 Sir Richard constructed headlines earlier this week when his Twitter account posted CCTV images appearing to show Labour leader Jeremy Corbyn strolling past empty unreserved train seats before he was filmed sitting on the floor complaining about “ram-packed” carriages on a Virgin Trains service.